Sue Savage, Josh Dooley, and the Indian Hill and Madeira Track and Cross Country Teams! That's right, we have not one, not two, but a whole lotta "Students of the Month" for January! Did you know at Power Ryde we have hosted hundreds of high school athletes over the last five years? We've hosted athletes from a variety of local high schools who play all kinds of sports. But the one group of athletes we help cross-train the most are runners. As a former high school runner and someone who loves to run in my spare time, I love this! I know from experience the benefits that Power Ryde and our full-tilt RealRyder bikes have for runners, because they've helped me tremendously over the years. This month we are highlighting Indian Hill's Track and Cross Country Coach, Sue Savage, and Madeira's Track and Cross Country Coach, Josh Dooley; both who come weekly in the Summer, Fall, and Winter and ryde WITH their athletes! What's even cooler? Coach Savage was my high school coach...and chemistry teacher; so teaching her is a total role reversal! I reached out to Sue back in 2013 when we opened Power Ryde and told her she had to come cross-train with us (Sue is not only a coach but an avid runner herself...as is Josh!). Sue started coming and after a few months, she began bringing some of her runners with her. This then progressed to her bringing the Cross Country team in the Fall and the Track team in the Winter. Indian Hill's runners were getting faster and staying injury-free. In 2016, the IH Boys' Cross Country Team qualified for state for the first time in 20+ years! The IH teams have also won their CHL league races, Districts, and sent several individual runners to the State meet for Track and Cross Country. 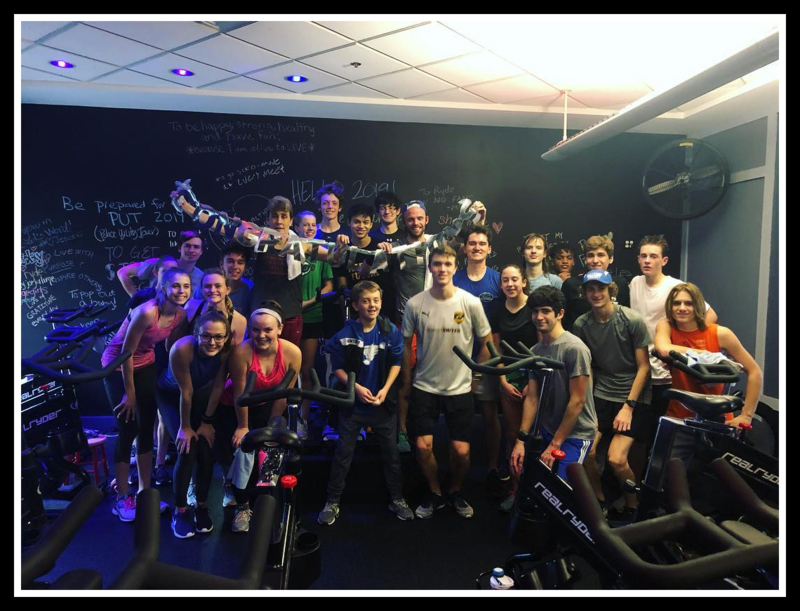 Two years ago, Sue invited Josh and the Madeira runners to one of her scheduled pre-season Power Ryde classes. Madeira's team did not disappoint; they came in full-force with energy, enthusiasm, and a karaoke talent that has yet to be matched by any other team! Madeira's Cross Country team has also seen much success since ryding with us; the last two years their Boys' Cross Country Team qualified as a team for the State meet! And just recently their coach, Josh, was named the Enquirer's Division Two Coach of the Year! Madeira and Indian Hill both ryde with us weekly, three times a year (Summer, Fall, and Winter) and the best part is both of their coaches are right there sweating with them! The camaraderie between the runners is amazing; they work hard, ryde strong, and have fun while doing it! So we thought it would be fun to spotlight these coaches and their teams for our January edition of Who Brought the POWER!!! Do you remember your first ryde and how you felt after? What kept you coming back for more? Josh - The first ride was sooo much fun. There was such great amount of energy, music, and sweat. After the ryde I felt like my legs were pumped up and could feel the burn making me feel stronger; knowing that I could instantly feel results enticed me to keep coming back. Sue - First ryde was just weeks after you opened up the studio. I have always loved biking, and Power Ryde is very close to actually riding on the roads, but it is a lot safer. I felt awesome! I keep coming back because cross training keeps me healthy and fit. Power Ryde is a great workout!!!! You both coach high school track and cross country, why do you bring your runners to ryde with us? J - I bring the team to get powerful cross training in and a double workout without over stressing their legs. We spin and then run some days to get double the effort. (True story, the Madeira team was in Monday and they worked extremely hard. Then when I went home two hours later, I saw them all leaving the Bike Trail after their run; AMAZING!!). S - I like to mix up the training. Power Ryde is a great cardiovascular workout without the high impact of running. It also works muscle groups in a different way to help prevent injuries. Plus it is FUN! What is the biggest benefit you have seen (either personally or with your teams) by cross-training at Power Ryde? J - The biggest benefit I see is the team having so much fun when they sing along to the music. They get to create a fun atmosphere while still crushing a very tough workout. They truly enjoy the rydes; gaining that quad and glute strength. S - Athletes enjoy the variation in training; they seem more motivated. Since starting Power Ryde both the boys and girls teams have experience success at the league, district, regional and state levels. What is your favorite (or your team's favorite) part about ryding at Power Ryde? J - Our favorite part is the fun team morale that they create. It means nothing to us if we don't enjoy the process of gaining strength to become better runners and athletes. S - Ryding hard together. Getting pumped as we work up a hill. Just awesome stuff! J - I can't pick just one. Each class my favorite moment is grinding up that HEAVY, HEAVY hill feeling the rhythm of the music and the burn in the quads while glancing up to see each member of our team putting in necessary work to achieve our goals. J - I have run the last 15 Flying Pig Marathons and this year I want to go under 3:00 and get that BQ (Boston Qualifying) time! I believe that Power Ryde will help me achieve that!!! S - Coaching for 35 years. Collegiate runner and 4 year letters at West Virginia University. I continue to training and compete in road races and triathlons at the age of 58. GO BRAVES!! !